My costume is specifically the light blue square Tetris, out of all five of us. My friends and I decided to be the Tetris pieces after seeing a picture of another group of Tetris people online. For the homemade Tetris costume we used cardboard boxes for the base of the shapes, solid color wrapping paper to get the color, duct tape (it was originally electrical tape) for the outside line, and packing tape to hold the pieces together from the inside. It was most difficult making the pieces line up and fit together when we stand next to each other. The hardest piece to build was the “Z” shaped piece, because we connected four boxes together. It is pretty difficult to walk because there’s limited visibility and constricting space to walk for some of us, but for myself and the “Z” shape – we can twist the box sideways so it is easier to walk. 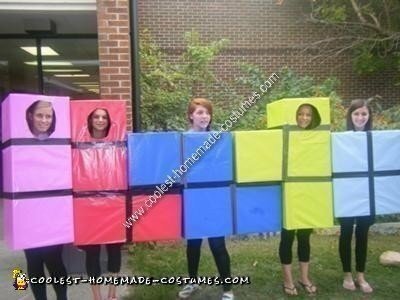 Overall, I’d say we’re the coolest homemade Tetris costume ever.